To the left the 2009 oloroso de añada, to the right the 2009 fino de añada, both from the brilliant Williams Coleccion Añadas. These side by side comparisons are marvellous ways to find out about these wines. Here we have two wines from from the same old vine palomino in the same albariza vineyards in Añina and Carrascal (Jerez) that have both been ageing for the same seven years in botas of american oak of 500 and 600L before the saca in the same month – february of this year. The difference is that the fino was fortified to 15º after fermentation, allowing it to develop flor, whereas the oloroso was fortified to 18º and allowed to age “traditionally”. It all makes for a rare opportunity to observe the results of the action and protection of the flor on the wine. Starting with the fino, I would hazard a guess that the flor wasn’t the most robust: the difference isn’t as dramatic as it might have been with, say, a seven year solera fino vs a seven year oloroso. 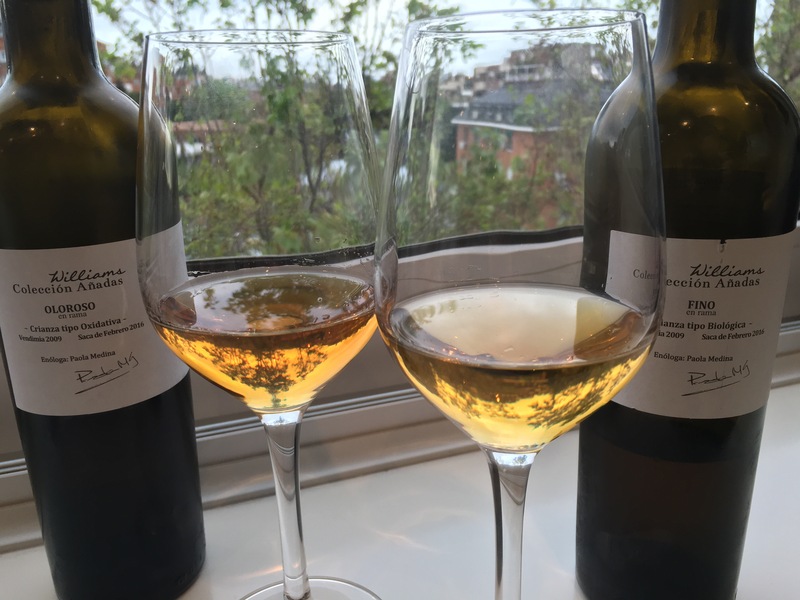 (I don’t necessarily attribute that to the 7 years – the 2006 Vintage Fino was under flor for eight and from memory was yeastier and finer, more mineral.) Rather, as I have mentioned before, the fino seems to have retained some glycerin and, while the minerals and nuts are there, it also seems to have seen some oxidation giving it a sweet creamy character. There is what I often describe the illusion of fruit: although it is a dry, punchy wine, with minerals and zing, it has more body and juiciness than you would expect in a seven year old fino. Despite that oxidation in the fino the contrast with the oloroso is fascinating. The oloroso has just a touch more orange colouring to it but maybe the biggest contrast is in the nose. While the fino has refined profile and is relatively quiet on the nozzle, the oloroso jumps out at you with sweetness and alcohol – like rum and raisins or a pina colada. On the palate the oloroso has an evolved version of the buttery, rice pudding mellowness of the fino – like the burnt skin of milk on a rice pudding – and has just a touch of a spikier, more acidic edge to it. It is fully dry but the flavour is rich sweet hazelnut, although alcoholic. I get the sense it prefers the cold – I am finding the four additional degrees of alcohol even more jarring as it warms up from 12 degrees or so. I do love these Sunday evening science projects!